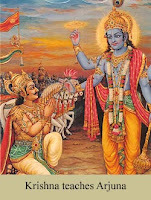 Krishna: Yr having 2nd thoughts. I understand. Everything you own, everything you are, everything you know is back there, right ? Yr not prepared, you think. You forgot to pack yr toothbrush. You forgot to lock the front door. You forgot to turn on the machine. You forgot to turn off the stove. You may have left the bathwater running. You dont speak the language of --wherever it is we're headed. Arjuna: Sounds like leaves moving in the wind. Krishna: Its the sound of writing. Theyre writing yr name in the Book. Krishna: Why not yr name? Arjuna: Im afraid. A little. At the start theres always energy. Sometimes joy. Sometimes fear. By the end, youll be so deep in the habit of continuing on youll pray youll never stop. Happens all the time. But dont take my word for it. Lets go and youll see for yourself. Get up. There you go. Breathe. Okay. Come on. Doesn't Parks just make you want to jump in and hang on? Keep going! Remember to breathe!